Castlevania is without a doubt one of the most loved franchises in the industry. When Mercury Steam re-invented the brand with Castlevania: Lords of Shadow, we seen an outpouring of feelings from fans. Some were amazed that the series could be so fully realized in a beautiful 3D world. 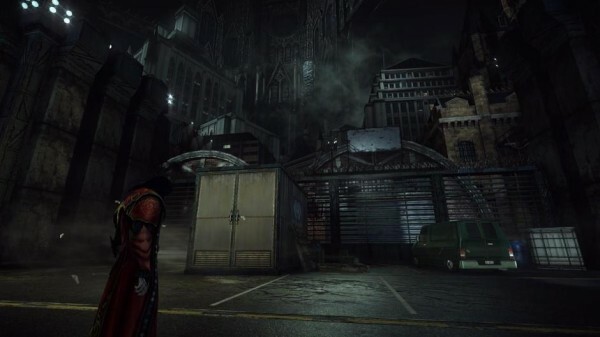 Others cried foul and compared the reboot to God of War and Devil May Cry, stating that Castlevania sold out. 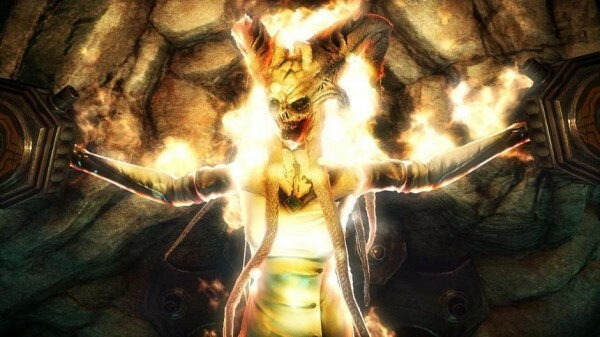 Before I go any further, I will say that Lords of Shadow did not sell out and was its own experience, like it or not. We were given a gift of potential with that one release, where a new start was in full bloom and seeing the name Mercury Steam was now something to be excited about. 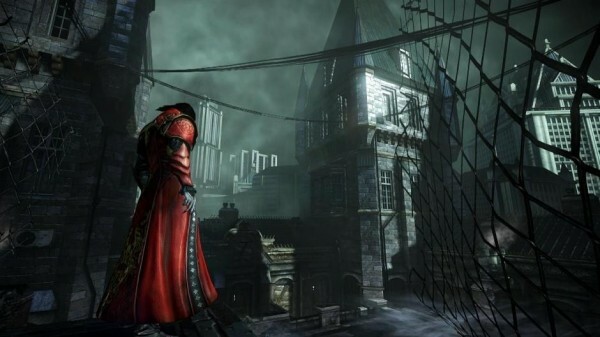 Castlevania: Lords of Shadow 2 is the highly anticipated follow-up, and wants to further the lore of Castlevania with a new tale for Dracula. Does it live up to expectations, or does this title need a stake through the heart? Let’s find out. Dracula, also known as Gabriel Belmont if you have been following the releases of both Castlevania: Lords of Shadow and Mirror of Fate has been a tortured soul, and one that carries a stark image of darkness and torment due to his heavy sins of the past. That is what makes this game stand out, as our main protagonist is still as interesting as ever, with some incredible writing greeting us right at the doorway of this sequel, seemingly ready to take the player on an unforgettable ride. Now having one goal in mind, the head of the Belmont clan must team with an old foe by the name of Zobek to find peace, which in this case means working for an enemy in order to rid the world of Satan and his minions. Its an interesting story that starts the player off with enough “catch-up” that they don’t even need to have played the past two releases in order to understand the events, as the cutscenes at the beginning are long and told in a way that brings the player up to date with this historic family lineage without much misunderstanding. As the game progresses however, a lot of this beautiful writing takes a backseat to padding – meaning most of the middle is simply filler to add to the game’s overall length. To break this down a bit, it works sort of like a television show that starts off with a bang, has a lot of standard and predictable episodes in the middle, and then tries to get the player to care by the end with a bit of build-up towards the climax. This method of telling a narrative is not new, but doesn’t work that well here as we have a story that could have said more, but was muted for scenes and breakthroughs that ultimately don’t meaning anything. Sure, the main characters in Castlevania: Lords of Shadow 2 have some depth and come across as interesting, but their motives can come off as unclear and foggy, which makes them seem like mysterious beings that are ultimately empty antagonists. We see several old faces from the past as well, but even their additions seem a bit stapled in. They may fit the atmosphere and dark tone that this title has going for it, but I kind of feel that Mercury Steam wanted to force fan service of its own retelling a bit too much, leaving a lot of questions still unanswered while squeezing the last bit of life out of old faces just for the sake of it. This title also has a more modern feel due to a lot of the technology involved. 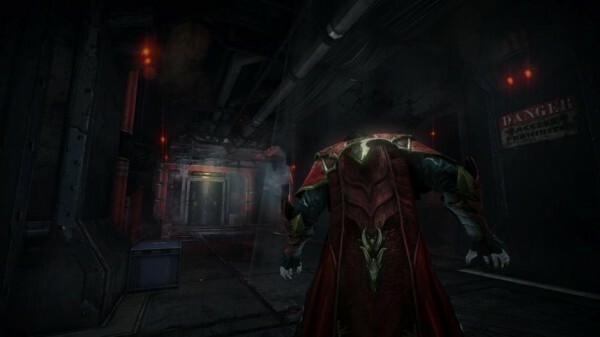 As it sounds, this is also out of place – no matter what the narrative, as not being able to take out a man in a mech suit when you’re playing as Dracula truly hurts this character’s own story by injecting him with a strong weakness as he leaves to take on the most powerful force of evil in existance. Would you hire a shell to do your dirty work and just pat them on the back, saying “you’ll get there, bub”? Zobek does, and while it makes sense in terms of gameplay and general game design, it does nothing but open up plot holes and even lightly insult those of us who have been invested during the prior console and handheld release. Set in an open world of sorts (or one with at least the option of free roam), Lords of Shadow 2 takes a lot from its predecessor in terms of combat. This is still an action title first and foremost, where the hack and slash fighting is the main way to defeat foes with little trouble. Instead of the Combat Cross, players now have the blood whip – which controls about the same and has a wide array of upgrades and combos that can be used to gain the upper edge as you progress to more dangerous foes. The blood whip is the default weapon and controls fine – but it does look a bit…off. Imagine if some crazy man slit his wrists and started flinging blood at you. Sure, it seems twisted, but I honestly chuckled a bit the first few times I was lashing out at enemies, as this “weapon” seems to have been something quickly put together just to give us something with infinite attack power. 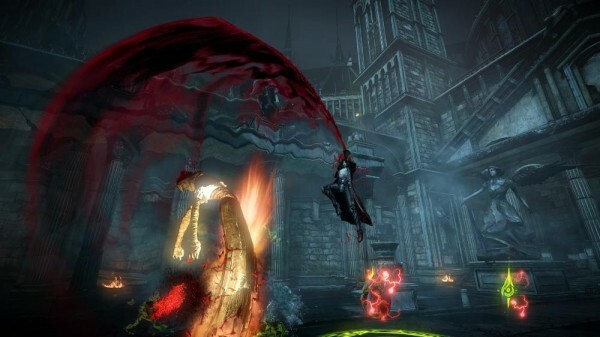 That said, the blood whip is the most accessible option in terms of combat as well as the smoothest, so Dracula has a lot more to worry about in this game than just looking goofy. The Void Sword is another key item for Belmont, allowing him to slash through foes with greater ease at short range, or freeze enemies and environmental objects in order to solve a puzzle from time to time. 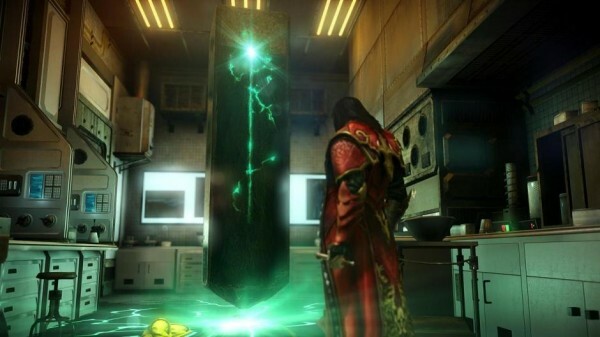 Its a great weapon that comes in handy during many encounters due to its extra healing abilities, but also has a bar that drains rapidly and can only be replenished with the appropriate gem, so the user must keep this in mind while fighting as a puzzle could be right around the corner. To be fair, the game does give the player enough opportunity to have a little power for the Void Sword at almost all times, and again, the upgrades will assist down the road when it is truly needed – so its not nearly as “draining” as it sounds on paper. The Chaos Claws are about like they sound and can maul strong foes with powerful melee attacks to break shields and make quick work of the little guys. Just like the Void Sword, utilizing these gauntlets drains energy, but at a lesser cost as the claws do not serve as great of a purpose in the game outside of combat phases. 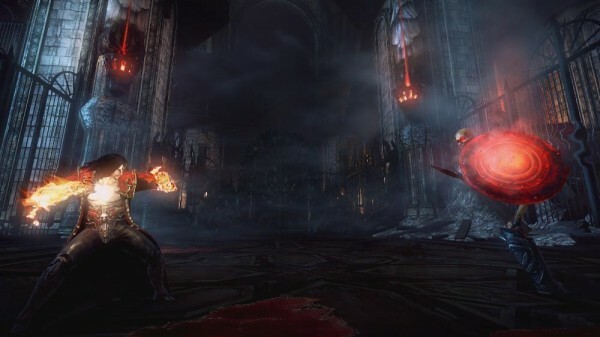 Belmont also has a good number of other abilities, such as summoning a swarm of bats or firing a blood projectile, but these are really not useful during the battles that matter, and only show their true potential when used on the few enemies that have a weakness or that need to be distracted. While I am on those bats, they work rather well for distracting enemies, and other foes can react to the power and try to save their ally who has been overcome. That reaction doesn’t happen everytime, but it does show that attention went into making the AI somewhat smarter this time around, which is definitely a plus compared to the somewhat brainless enemies we seen in Lords of Shadow. To be honest, while switching between these powers can be a chore of sorts due to a convoluted scheme where the D-Pad is OVER utilized, these abilities still function and have a purpose. The platforming? Well, its not great – but you can definitely get from one place to the next without much frustration, as Dracula is not Bayonetta and the supposed weaknesses he has obtained kind of feel to be running in place with the somewhat stale jumps. What is bad is the stealth sections that are forced upon the player far too often. While standing in shadowy areas, Dracula can turn into a rat. Yes, that is right…a rat. The transformation resembles other titles that will not be named as I don’t want to start the argument of the ridiculous “infringement of mechanics” conversations that plagued Lords of Shadow and so many other games in the past, but you have to admit that the shoe just does not fit right here. While playing as a rat, the player can go mostly un-avoided by enemies, and now have their HP made up of the many rats that follow behind them. One dies? That is ok, you just go into the next. Crossing narrow paths, having to participate in terribly designed puzzles that require jumping as a rat and other tedious tasks however make this gimmick completely unenjoyable. I know, Mercury Steam wanted a longer game, and nothing is better to pad out a game than a few lengthy stealth portions. Arkham City did it, Bioshock had its moments, and similar titles have made the genre fit well by blending it into the main genre that their particular game boasted up front. The thing is, Lords of Shadow 2 doesn’t blend this at all, meaning there is an immediate slowdown compared to the much more action oriented paths before these sections, and the attempt of throwing in possession of bodies to further the stealth element just makes it feel muddy and convoluted – as you become what feels like a puppet without strings. Look at those paragraphs above where I described all of Dracula’s abilities. Look at them. You can have good puzzle solving without changing the formula for your main protagonist. You can have stealth with just those mechanics attached, as there are some clever ideas at work. I DO NOT NEED TO TURN INTO A RAT AS I AM THE PRINCE OF DARKNESS! 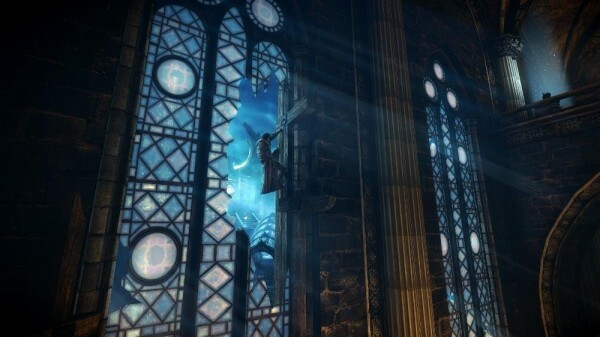 The shining moments within Lords of Shadow 2 come during the boss battles. Each come on a semi-grand scale for the most part, and present themselves with both challenge and strategy attached. These fights allow your arsenal to finally show some use to abilities that never match up to that old fashioned combo scheme that is at the very core here. During an epic boss battle, you feel slightly redeemed after chugging through all of the unfinished ideas from the level before, and in all honesty, if this title were to be more of a Shadow of Colossus clone and just rely on puzzles (without vermin) and battles, it would be a better game because of it. I did have some frustrating moments where the game would completely freeze (especially during one of the earlier battles), but checkpoints allow you to pick up where you left off. While this shows a lack of testing, it doesn’t take away from the big picture we are presented with. From the trailers to the cinematics and all of the hype in-between, its not hard to tell that Lords of Shadow 2 was destined to be a beautiful game. In its dreary setting, its not hard to appreciate the environments before you, as the backgrounds feel so rich and deep that you want to jump into them and explore. The world you actually traverse is a bit less stellar on foot, with bland textures and occasional screen tearing during hectic action. The cutscenes also have the tendency to stutter or freeze, and while skip-able, having this problem to start with takes away from what could have been such a stellar experience due to the atmosphere alone. As I mentioned, the boss battles show some wonderful production value, and can make the experience if one is willing to trek through a not empty but lonely path to get there. The character models work fine, even if they lack a bit of that spark from the first title. Sure, the characters are mostly the same – but there is something a bit off, as if the models lack the ability to display natural movement and fluid animation to seem believable. Even the dreaded rats suffer from animation hiccups, and when you are playing on a large, HD screen, this becomes even more noticeable. This is the area where I have nothing to complain about. Lords of Shadow 2’s orchestrated soundtrack is sweet music to the ears, making the experience feel much larger and grander than it truly is. Each tune compliment the environments and setting well, giving one a sense of hope among pure darkness. The voice acting is also superb, with Richard Madden, Patrick Stewart, and several others lending their talents to bring these characters to life. There was a ton of attention put into the audio, and while the gameplay and even the visuals can’t quite live up to the scale of quality here, it is good to see that Mercury Steam had the tools to sharpen the production value greatly with an amazing soundtrack and high end performances that make even the most pointless cutscenes watchable. 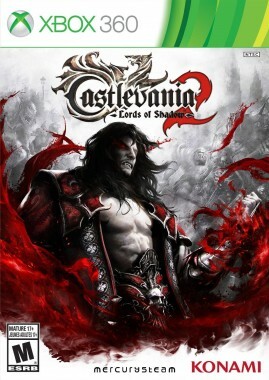 Castlevania: Lords of Shadow 2 is a good game mostly, but one that has let too many hands take the chalk, leaving us with a masterpiece buried underneath scribble. For every highlight, there is a lowlight that makes the player wonder why they are fighting an awkward battle of frustration and disappointment when all of the tools for greatness are readily available. This isn’t Mercury Steam’s first try with this series, and we have had proof that they can do better. 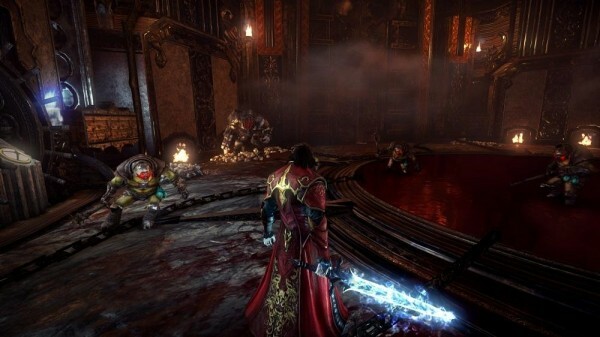 It doesn’t matter that this franchise is Castlevania at all with this reviewer, as Lords of Shadow is its own modern thing, and should not be compared to titles like Symphony of the Night or the originals seen on the NES. That said, a grand sequel should add ideas but keep what worked, not force a ton of gimmickry just to attract multiple audiences. Castlevania: Lords of Shadow 2 is far from a stake through the heart to the franchise we all know and love, but an experience that deflates quickly due to the large amount of hot air blown in.